Africa abounds with incredible sights - the resplendent beauty of the open savannah, the vivid shades of colour in its lush jungles, and its incredibly diverse wildlife. For many of us who are in love with the natural world, a trip to Masai Mara or the Serengeti and a chance to see lions, leopards, elephants, rhinos, cheetahs, and so many more animals in their natural habitat would be akin to a pilgrimage. If you are a lover of wildlife and photography, there is no better way to experience the incredible biodiversity of Africa than a safari through its natural reserves. Here are 10 reasons listed by Jayanth Sharma, Co founder & CEO, Toehold why you should take an African safari at least once in your life. Why settle for just a few hours in this earthly paradise when you can spend the entire day to get an unbelievable experience of the iconic African landscapes? Start your day early and indulge in a full day of sightseeing and photography with nature on its full, untrammeled display. Travelling through the day increases your chances of seeing more wildlife, as experts guide you to where different animals are likely to be spotted. A full-day safari also involves stops for meals, allowing for picturesque picnics in scenic surroundings. Any photographer would tell you that the correct lighting can make the difference between an award-winning photograph and an image that makes you squint, trying to find the subject of the image. Africa's gorgeous sunny plains and the various shades of the rising and setting sun provide ample opportunities to take all manners of beautiful snaps, capturing different facets and scenes of the incredible landscapes you will get to witness. Safaris also get you up close to African wildlife in action, and a picture with a majestic creature will be something to talk about once you get home. No African safari would be complete without an encounter with the African Big Five - lion, leopard, elephant, rhino and buffalo. However, this is just the tip of the iceberg - Africa is full of charismatic mammals to watch in their natural habitat, like zebra, giraffe, cheetah, wildebeest, hippo, antelopes, hyena, the lesser feline and canine animals, and numerous antelope species. Then there are the birds and the reptiles. These creatures form a part of one of the world's most untamed and natural ecosystems, and are amongst the biggest draws for tourists in the region. People tend to ignore the incredible diversity in bird species in Africa in their rush to capture pictures of large terrestrial mammals at their own expense. With nearly one-fourth of the global avian biodiversity being endemic or migratory to Africa, an African safari can give you an opportunity to see some of the world's most beautiful birds. The world's largest living bird, the ostrich, is found in the African savannah, while species such as the kori bustard, grey crowned crane, greater flamingo, marabou stork, and spoonbill can all be spotted in the rolling plains of Africa. Going off-road where it's allowed, and experiencing the wilderness on your own, is an experience that many travellers would enjoy - the sense of adventure and discovery in exploring quaint trails and paths leading from wooded areas and emerging into the vast, grassy plains of Africa. 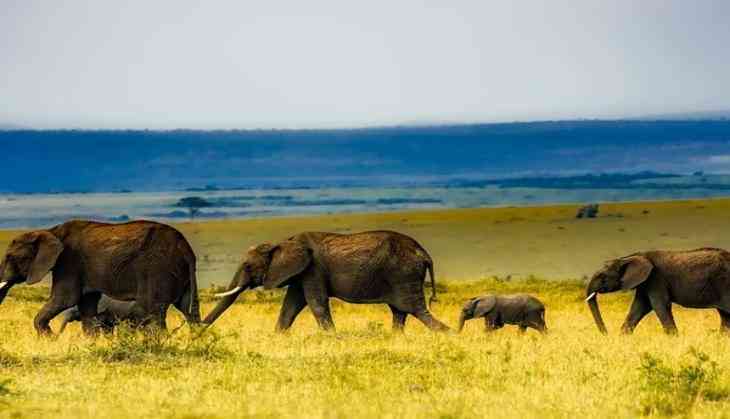 While most portions of the African reserves are cordoned off for such travel for the safety of animals and tourists alike, specific designated areas allow for off-riding. Rent a bike or an SUV and go riding off into the beautiful African sunset, and make this a true adventure for yourself and your family or friends. Aching for a bird's-eye view of the beautiful Serengeti? Imagine floating in a hot-air balloon and watching vast herds of wildebeest move over the arid landscape and cross the Masai Mara River. You have the option of taking a hot air balloon safari, offering a unique perspective and a great view of the amazing scale and beauty of Africa's gorgeous landscape. This is also ideal if you're looking for amazing photo ops of Africa's beautiful natural splendour, caught in the oblique rays of the golden sun over its verdant grasslands. Worried about feeling withdrawal when leaving the park once the sun goes down? Fret not, nature lovers. Many of Africa's natural reserves and nature parks act as hotels and lodges, allowing tourists to reside within the park 24x7! Feel completely immersed in the safari experience while residing in quaint and picturesque accommodations which also carry all the basic creature comforts. The parks offer a range of different safari lodges, ranging from extravagant to simple and catering to every budget. From the arid Sahara and Kalahari deserts to the wetlands in the Okavango delta in Botswana, Africa has a variety of different habitats, each with its own fascinating sights, sounds, and fauna. The sinuous desert landscapes, which transform into arid savannahs and grasslands, are then turned into river lands by Africa's freshwater systems, and the rivers turn into swamps and wetlands before merging into the sea. The tropical forests of Central and West Africa are home to Africa's great apes, found nowhere else in the world. Between the rocky plains, sandy deserts, luscious rainforests, arid grasslands, and muddy wetlands, such variety is sure to please you. Africa is home to thousands of different tribes, ethnicities, cultures, and settlements that exhibit the history of this awe-inspiring continent. From the moors of northern Africa to the Dutch settlers of the south, Africa has been a melting pot of various peoples from time immemorial. Any visit to Africa is incomplete without sampling the local cuisine and customs, and wandering through its many bazaars to purchase some handicrafts and local products. While on safari, you will get to witness the incredible life and times of cultures such as the Maasai, the Kalahari Bushmen, Pygmies, Dinka, Zulu, and the Xhosa. Africa has a lot to offer thrill seekers and adrenaline junkies: bungee jumping, swimming to the edge of the world's largest waterfall, white-water rafting, surfing, scuba diving, snorkeling, skiing, sand-boarding, and snowboarding, Africa is full of intensely fun activities depending on where you are and what you'd like to do. Various festivals and cultural events happen through the year, providing insights into the different lifestyles and traditions of ancient cultures that can't be experienced in any other way.